It’s a great time of year at SunBird with all of the activities and events in full operation. The clubhouse and recreational facilities are packed daily with residents enjoying and having fun! The weather has been terrific and is arguably the best in the country. We hope you take full advantage of all SunBird has to offer. The SunBird Golf Resort clubhouse was constructed in 1988 and is now 30 years of age this year. A goal of the community and the Board of Directors is to keep our facilities updated, clean and attractive. 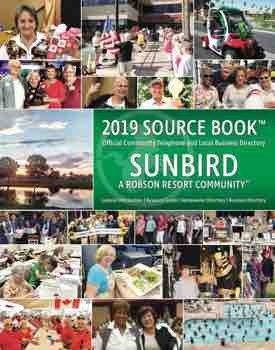 Over the past several years, many large improvement projects have been completed in SunBird, like the enlarged, upgraded clubhouse swimming pool, bocce ball courts and fitness room. The main driver in accomplishing this, just like any other project, is planning and funding. In 2017, the Horizon Room kitchen was expanded and remodeled, patio BBQ area improved with lighting, walls, sound system and landscape, clubhouse sewer lift station completely replaced, elevator back-up system installed, roadwork improvement and routine maintenance, parking lot added at main entrance guardhouse, additional swimming pool furniture added and more. This year, several projects are planned and budgeted for with this goal in mind. The expansion of the clubhouse adding an additional multipurpose room between the Navajo and Hopi Rooms on the upper level of the clubhouse. Replacing some of the older fitness room exercise equipment with newer equipment. Completely replacing some sections of asphalt roads to the ground and adding a thicker depth of asphalt. Replacing the old billiard tables with six new high-quality tables. Beginning the multi-year common area landscape refurbishment project updating irrigation lines and plantings. In the year 2019, more upgrades are planned for the clubhouse, including exterior painting, re-flooring the clubhouse, replacing recreational courts 1 and 2, continuing the landscape refurbishment project and replacing and updating some equipment at the clubhouse. Planning for these well in advance and saving each year ahead of time, makes it much easier to accomplish the goal of keeping and maintaining a beautiful clubhouse and facilities. With aging buildings and facilities, occasionally, surprises can occur. During the past couple of months, one of the 26 air conditioner units was replaced at the clubhouse. A water valve handle broke while in the process of changing out a faucet in the fitness room resulting in having to shut off the main waterline to the entire clubhouse on a Tuesday afternoon. Without running water, the restaurant had to be closed, per county health code, for lunch and the Tuesday night dinner. The laundry room building washers and dryers were recently replaced with new equipment. However, in the process, just like the clubhouse, a water valve broke at the handle and required extensive repair work. The vehicle barrier arm at Riggs Road main entrance was recently damaged by a vehicle trying to enter into SunBird without authorization by tailgating in behind the car ahead. The barrier arm began to close as the vehicle struck it. The driver did not stop, nor could patrol locate the vehicle in SunBird. Fortunately, the surveillance cameras at the gate clearly recorded the incident at various angles. The license plate and evidence were turned over to the Chandler Police Department who were able to provide identification and insurance information of the owner of this vehicle. The expense to repair the damage has been billed to this driver.